Hurricane Sandy, aka Frankenstorm, an ominous mix of a hurricane and a winter storm, is scheduled to make landfall on the Northeast Coast of the US late Sunday night, early Monday morning. The Associated press gives 5 reasons why Sandy is expected to be a Superstorm. Hurricane Sandy is moving very slowly toward the north-northeast and is expected to continue its current path parallel to the Carolinas over the weekend, forecasters say. At some point, it’s expected to become what’s known as an extratropical storm. Unlike a tropical system like a hurricane, which gets its power from warm ocean waters, extratropical systems are driven by temperature contrasts in the atmosphere. At some point, probably Monday, Sandy will begin to turn back toward the coast and eventually make landfall over Delaware or New Jersey. Weather Underground co-founder Dr. Jeff Masters says “Sandy likely to be a multi-billion dollar disaster for the U.S.”. Sandy should bring sustained winds of 50 – 70 mph with gusts over hurricane force to a large section of coast. With most of the trees still in leaf, there will be widespread power outages due to downed trees, and the potential for a billion dollars in wind damage. Google Maps has created a couple of interactive Hurricane Sandy maps. WNYC has put together some helpful resources for people who live in New York City, including evacuation zones and suggested survival kit. 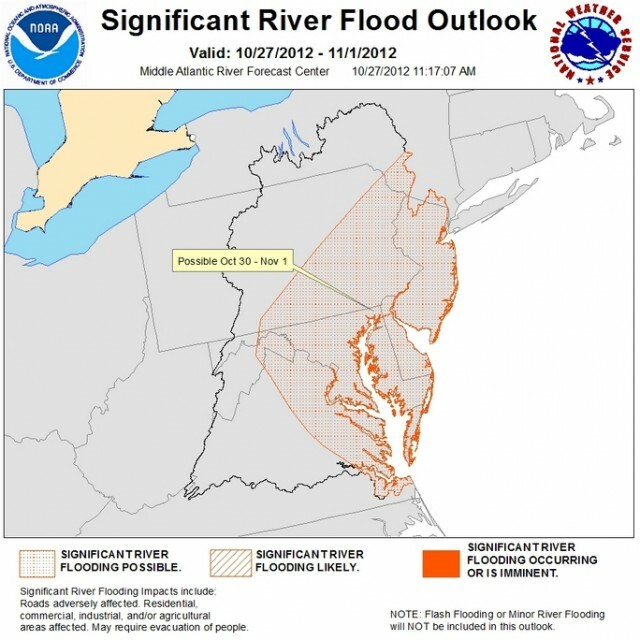 MARFC has projections on river flooding that could be could by caused by Sandy.